Other than the most rewarding satisfaction I have received from seeing tens of thousands of lives changed by the McDougall Program and the glowing words of appreciation I have been given by many of my patients and other followers, my work has largely been unrecognized in any formal manner. Fortunately, this lack of coveted, yet somewhat superficial, attention causes me almost no distress. However, I admit, a little attention from the establishment would be welcome. On November 13, 2012 I received an award honoring and commending my work during my evening presentation at the Hawaii Vegetarian Society in Honolulu. State Senator Mike Gabbard, a democratic member of the Hawaii Senate (19th District), presented me with this certificate and many kind words. The source of this acknowledgment was especially relevant because Senator Gabbard has battled for better nutrition for the citizens of his state for many years. His Senate Bill 2136 in 2008 was supposed to require the Hawaii State Department of Health to develop nutritionally sound public school menu plans that give students the option of a vegetarian school lunch meal. Unfortunately, his timely effort was defeated. Fortunately, the Senator continues the battle undeterred by the opposition. An honor from my home state of Hawaii was personally touching because almost everything that I use today to help people I learned during my early years of medical practice there. My first medical license, which is currently active, was from Hawaii. I received training as a surgical intern at the Queens Medical Center between 1972 and 1973. My internal medicine education was from 1976 to 1978 at the University of Hawaii. However, my most important lessons came in between these periods of formal schooling. Between 1973 and 1976, I cared for nearly 5000 plantation patients while working for the Hamakua Sugar Company on the Big Island. During these years as a general practitioner my responsibilities were enormous because I was the only doctor immediately available; the nearest specialists were 41 miles away in Hilo, Hawaii. I attended my patients in the beginning when I delivered their babies and also at the end when I pronounced them dead. In between, I was called on to do tasks as mundane as prescribing salves for toe fungus and as frightening as brain surgery in the middle of the night following an auto accident. Two major observations from my plantation days served as the foundations for my lifelong medical practice. One was the woeful lack of benefits I saw from most standard treatments, and the other was the importance of food for preventing common chronic illnesses. 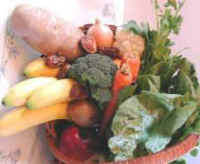 Most of my patients failed to heal from my prescribed drugs and surgeries; as a result I looked elsewhere for solutions. My first-generation Filipinos, Japanese, Chinese, and Koreans were trim, disease-free, strong, and long-lived on a diet mainly of rice and vegetables. Subsequent generations progressively abandoned their traditional diets for more meat, dairy, and other junk, and as a result gained excess weight and became sick. Since 1978, when I began my office-based medical practice in Kailua, Hawaii, I have worked to eliminate unnecessary medications for my patients and to show them how to regain their lost health and appearance by changing to a starch-based diet. Today I enthusiastically teach the same messages at my live-in clinic in Santa Rosa, California. The past forty years have been far from “a thankless job,” as the real rewards in life come from helping others. 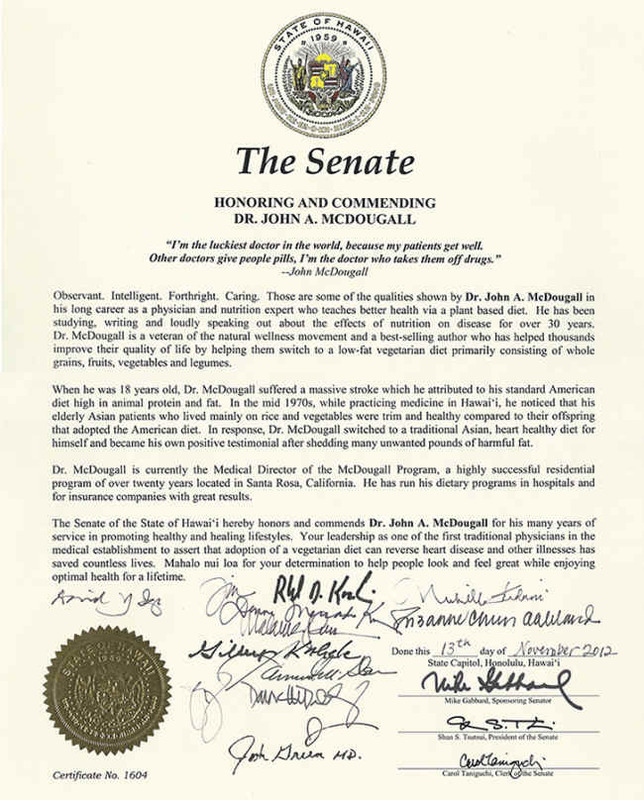 My great hope is that this certificate of accomplishment from the Senators of Hawaii will act as a signpost marking the moment when the ruling classes of the world will no longer deny the life-sustaining roles nutrition plays in human health.